JD-U Sharad Yadav on Tuesday said lynching of a dairy farmer by cow vigilantes in Rajasthan was "unfortunate" and criticised the Centre for failing to control the menace. 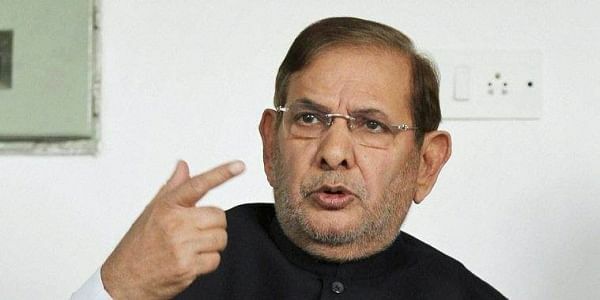 NEW DELHI: Janata Dal United (JD-U) leader Sharad Yadav on Tuesday said lynching of a dairy farmer by cow vigilantes in Rajasthan was "unfortunate" and criticised the Centre for failing to control the menace. "Government is unable to control cow vigilantes as again one Ummar (Khan) has been killed in Alwar while transporting cows and calves," Sharad Yadav said in his tweet. He said it is "unfortunate that such incidents are increasing" and added that the "farming community is also being affected badly" by this "inhuman" act. Khan, 35, was allegedly shot dead by cow vigilantes in Govindgarh on suspicion of smuggling the animals while another person was injured. Khan's dismembered body was found on the railway tracks in Govindgarh on Friday. On April 1, 55-year-old dairy farmer Pehlu Khan from Haryana was assaulted by cow vigilantes on National Highway-8. Two days later he succumbed to his injuries.